Never let it be said that tiny furry creatures don’t have personality. Princess greets her family by standing up against the side of her crate and squeaking, greeting them when they’ve been out of sight. Read the story in Amanda’s own words. “She absolutely loves chin rubs and is starting to like being petted on her back,” says Amanda Endicott of Wauconda, IL, who adopted her from The Critter Corral in Steger, IL, after seeing the listing on Petfinder. “Adopting her from Critter Corral has been a rewarding experience,” Amanda says. “They make it very easy and the adoption fee is less than it costs to buy a pet store animal. Plus, knowledgeable and experienced pig owners can help you select the right pet,” she adds. 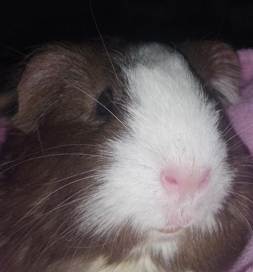 She enjoys sitting on their laps, and of course, salad time is a favorite and “she will wheek loudly for her food. She’s even taught the other pigs to do the same.” It seems Princess is the perfect name for this pig who has become like royalty in the family. Don’t have space for a dog or cat? This is Adopt-A-Rescued-Guinea-Pig Month, so consider adding a couple of these small, amiable characters to your family. To find adoptable piggies, just enter your Zip code and then “Small & Furry” under “Type” in the Petfinder search boxes.